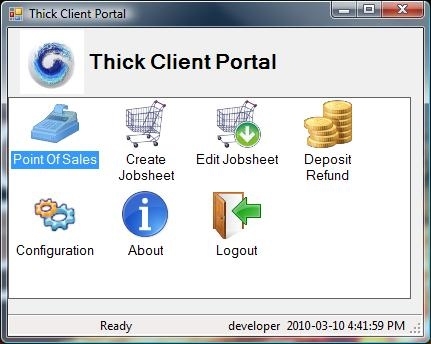 Wavelet's VB ThickClient is a POS System that enable users to use POS offline (unlike the web-based EMP). 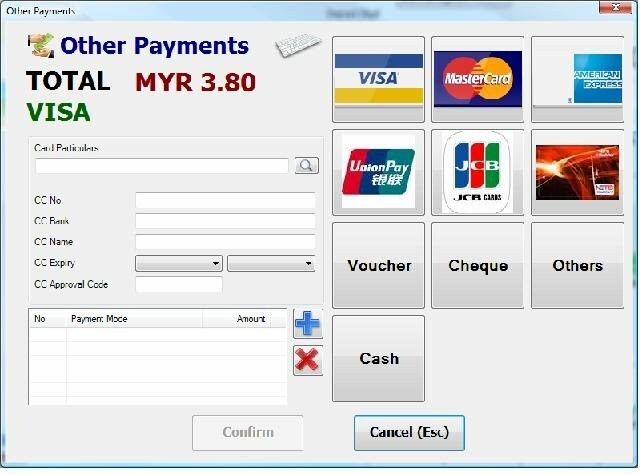 This POS System is suitable for EMP customers who has trade affairs in shops or any areas with no (or weak) internet connection and high traffic flow of customers. ThickClient is simple, user-friendly and easy to install! 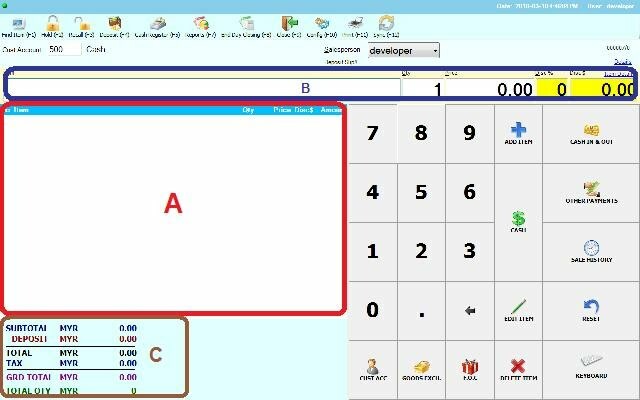 Here is brief but detailed guide to install the POS System by yourself - POS - Mini Market (VB) Installation Guide. 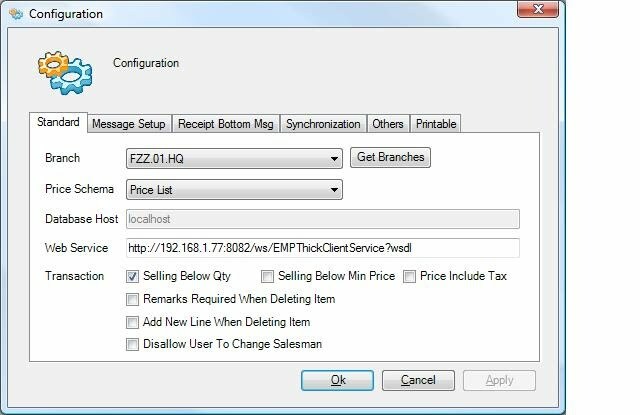 The main advantage of VB ThickClient is that, it is able to sync with EMP's current Inventory item codes, prices and stock balance. After importing all the data from EMP to POS, users can go offline and start selling their products on POS. At the end of the day, POS user will again, go online to record the sales (multiple payment modes are allowed) and print out reports for management's monitoring. This high-level linkage and integration makes it possible for users to ensure that their inventory level and sales collection are kept accurately and updated at all times. In the following documentation, each part and function of the POS interface is broken up and explained individually (from left to right, top to bottom). Then, the linkage and subsequent steps are shown for better understanding. To add an Item Code, just press F1 and key in part of the item code and press enter. Select the correct item code from the list by using arrow up / down and press enter. Press F2 to hold unconfirmed transactions. To recall held unconfirmed transactions, press F3. Total Sales Collection based on dates and cashiers. Select Date From / To which day and time. Cashier : Select user name / login name for ALL or individual cashiers. Counter : Each POS has a unique number. To check your Counter number, refer to F10 Config. Every hour when a sales transaction is made, the report will display between 2 hours in 24-hour system. Eg. 17-18 means X number of bills created between 5-6pm, with the total Sales Amount. Shows individual cashbills which have been void in that period. This amount will NOT be included in Total Sales and Cash Drawer. Very similar to F4 Detailed Void Report except that it shows a grand total, whereas, F4 shows separate cashbills. This report shows you every individual transactions in the period set. In each day, you may have a many official receipts shown in this report. Before you perform a void of Receipt, you may view this report to vouch the authenticity of the bill or check the bill number (required when void). 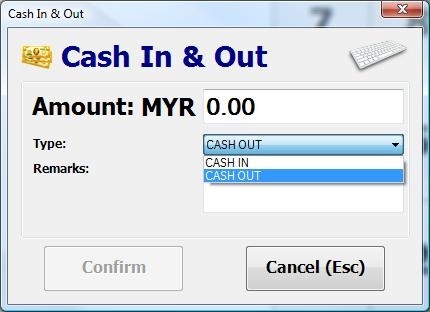 This function closes the amount in cash till to tally with Sales Collection. Basically, it sums up the total sales amount of all the users for the day and subsequently, displayed in the report generated upon logging out. Green Light - Online > When you are logged on to Wavelet EMP. Select a Salesman name from the list. The names are configured in Wavelet EMP. Date and Time will appear in Receipts, Reports and Login / Logout records - follow settings in computer. Username - As login in POS and EMP. Already confirmed for purchase and added to list appears, here. Pending to be confirmed and then, added to the list on the left. Quantity and Item Code shown here. The currency is determined by the settings from the Wavelet EMP. Cash In is sometimes used for float money. When a cashier first opens till for the day, a float may be needed as "Change" given to customers. This amount will be set aside from Sales Collection. Float money will need to be separated back from the cash drawer at the end of the day. Sometimes, expenses need to be incurred for the operations of the business. This is where the expenses can be recorded and monitored by the manager. Normal procedures also includes, banking-in a certain amount for a certain time of the day, Cash Out can be used. Enter additional information in Remarks. A preview report will be printed out automatically. If no card reading devices are being installed, the user will need to key in the details manually in its respective fields. DO NOT KEY IN ANYTHING UNDER "CARD PARTICULARS"
Key in the details in "CC Approval Code" after the Approval Code has been obtained. Collect the receipt printed from the EDC machine and enter the approval code here. This approval code is created by the bank after a transaction is complete (when the card is swiped). When a transaction is being voided, sales will be deducted. Enter the cash bill number and click select. Click VOID and a pop-up window appears requiring user to enter any Remarks. There after, the user will need to click on "update item" for the new price to take effect. 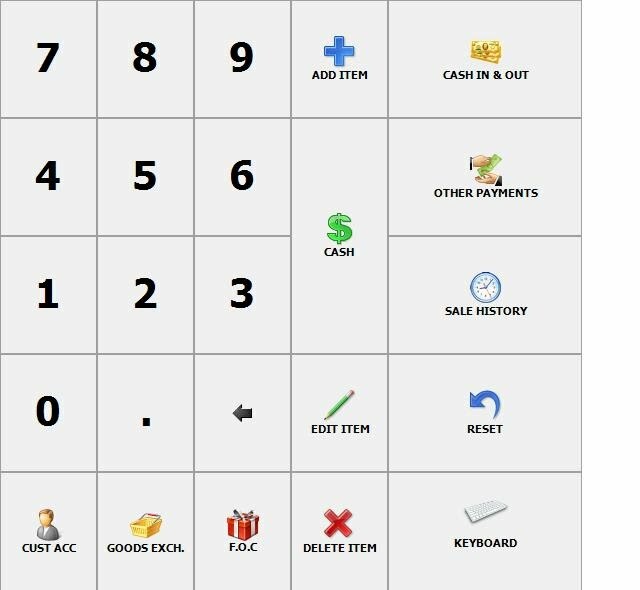 Allows the user to remove any pre-loaded item by highlighting the desired item to be removed from the list and click "Delete Item"
Please ensure that you logout every time you leave the POS. This is to deter fraud. Other people may use your username on POS to sell items but pocket the money in the cash drawer. After logging out, a Sales Summary will automatically be generated and displayed, up to that time of logout. Please refer to Linking the POS to EMP Server on the Web Service. Note that, the Branch and Price Schema are already set in EMP. By linking POS to EMP, you are actually getting the configurations done in EMP into POS. After setting the Web Service, just click 'Get Branches' to get the Branch Listing. Then, select a Branch from the list of where the POS is operating under. Tick 'Selling below Qty' - to allow POS users to sell quantity items exceeding the quantity in EMP. Check 'Selling below min price' - allows users to do just that. Minimum price is set in EMP. Message Setup is for setting confirmation messages before the POS completes an action. It also acts as a mistake detterant. It makes the users take a second look and check before they do something on the POS. Check the box to select which action you want a prompter. The type in the Message Confirmation. This feature enable you to set what is it that you want to show in the Receipt given to customers. In the example above, Message 1 and Message 2 has been entered. Then in the Receipt printed upon transaction, the two messages appear at the bottom line-by-line. Message 1 appears first, then followed by Message 2. Sync Service - To coordinate all the data from database from server into the POS. Example : Item codes, Stock balance and Pricing. User's Records - How many users are added into EMP - Add / Edit Users. Item's Records - Number of Item codes created in EMP. Stock's Records - Active Item codes with stock movement (GRN / Invoice). Cash Account's Records - Number of Cashbook from EMP. This amount also includes Cash Accounts which are Inactive / Deleted. Welcome To - Company Name / Store to appear on the POS interface (above Area A). Logo - Company logo / picture to be displayed (above Area B). Click 'Browse' to select the file which contains the logo. Any image file is accepted here. Syncer Timing - How long each Synchronizing should automatically be done. In the example, 5000 (means 5 seconds), in every 5 seconds, data from the POS will be updated to EMP. User must stay logged on to the POS before F8 End Day Closing can be done. The hours can be selected from the arrow up / down. The reason why this function is added is to prevent End Day Closing to be done every hour / minute. As a result, End Day Closing would serve its purpose anymore. Example : 1 day = 1 or 2 End Day Closing. When generating reports, End Day Closing can be selected instead of setting date range. To make End Day Closing selection easier and more consistent, limited number End Day Closing is preferable. Thus, this function is useful here. In a middle of a transaction, you may want to hold the current transactions first and then move on to the next. Just press F11 and then start with a new transaction. If you want to go back to the first transaction, press F11 again. This means that the total number of transactions since this POS started to be in use amounts to 211. However, number of transactions for today is 37. Use scanner to scan bar code for every item. To Delete one item, select Item from Area A and press Delete button on your keyboard. To Delete ALL items in Area A, press F2. Cash - Press '+' (on number keypad) and key in the amount paid by the customer. Press Enter. Credit Card - Press F6. Swipe the credit card. Print the receipt from EDC machine and key in the approval code. Press Enter. For Cash, the drawer will pop out. Keep the money and take out the change as displayed on the interface. Hand over the receipt together with the change.